Container gardens are “in” and have been for several years. Planting in a container allows you to grow plants where you can’t otherwise. Containers allow apartment dwellers to grow tomatoes, but they also brighten the deck or patio of any home. Combination planters achieve the look of a “bouquet with roots” providing color all season long. Even where there is ample room for a garden, well-placed containers provide seasonal accents. Choose a container that fits your décor or style. Containers can be amusing, valuable, clever, loud, quiet, classy, creative, solid, sophisticated, stylish, primitive, homespun, friendly, understated, matched or anything you want them to be. But, they MUST have a drainage hole. Soils for containers must be well aerated and well drained while still being able to retain enough moisture for plant growth. Don’t use garden soil in your containers, it is too heavy and won’t drain properly. Purchase a soilless mix designed for use in containers. For succulents, herbs and perennials, select a coarse soilless mix with more bark, perlite or sand because these plants need good drainage and you don’t want the mix to retain moisture over long periods of time. For tropical and foliage plants, choose a media with more peat and less coarse material as these plants tend to prefer moister growing conditions. Moisten your media slightly before planting by filling a tub with media, adding water and mixing. Think of your container garden as a living flower (and foliage) arrangement. Include a tall plant in the center or back of the container. 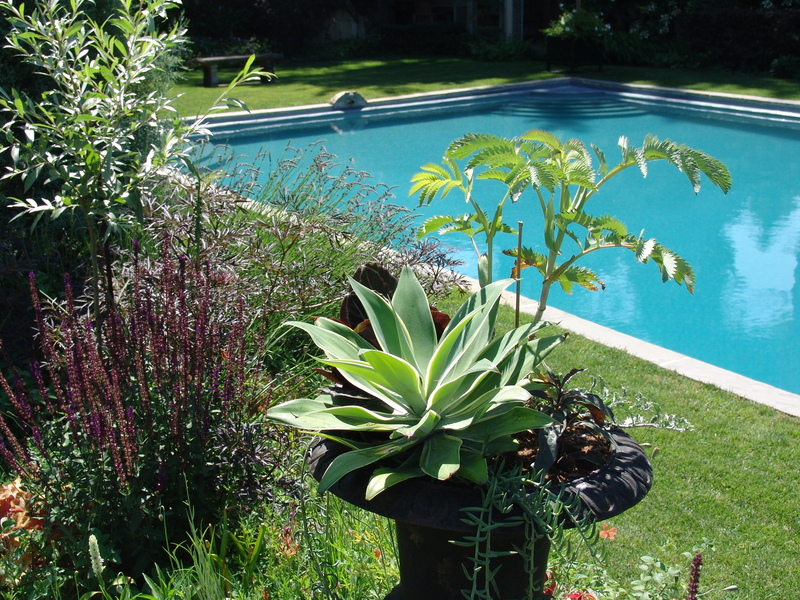 Select filler plants to provide interest and use cascading plants to soften the edges. Consider plant requirements when planning combination containers. Use all shade plants for shady locations and sun-loving plants on a sunny patio. If you use a combination of sun-loving and shade-loving plants in a single container, there will be no appropriate exposure for the container. Also, think about moisture requirements. Don’t combine plants that like it moist with plants that require good drainage. You can combine shrubs, perennials and annuals, but the annuals will need to be replaced the following year. Depending on the size of the container and exposure, the shrubs and perennials may overwinter in the container. Tropicals are fun to add in a combination container, but they will need to be brought indoors to survive the winter. If you combine a shrub and a tropical, you will have a conundrum—bring it in and the shrub will suffer; leave it outdoors and the tropical will die. Once you have selected your container, growing media and plants, fill the container (almost full) with media. Arrange the plants on the surface and play with the design until you are happy with the combination. Remove each plant from its plastic pot and loosen the roots, especially if they are circling within the container in which it was grown. Add a bit more media and water thoroughly. Watering after planting settles the media and eliminates air pockets. You may need to water several times to insure the media is thoroughly moist. Make sure water drains out of the hole in the bottom of the pot. A waterlogged container will not thrive unless you are growing water plants. Remember to water container plants frequently throughout the summer. Soilless media dries out more quickly than garden soil. Fertilize containers a few times during the summer. Annuals and tropical will need more frequent fertilization than shrubs and perennials. Evergreen and deciduous shrubs are combined with perennials and annuals in this sumptuous planter combination at Longwood Gardens. Striking architectural container set by the pool at Chanticleer. 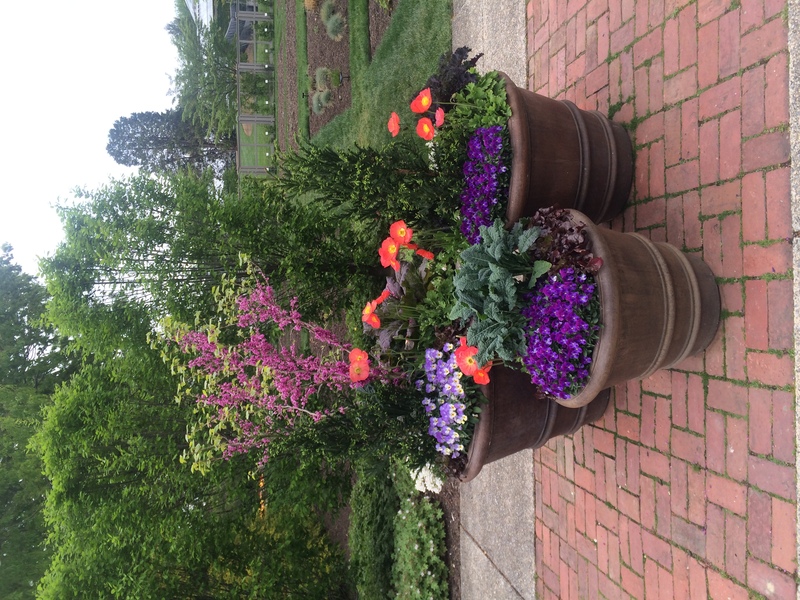 If you want inspiration for designing container plantings, visit a local public garden. 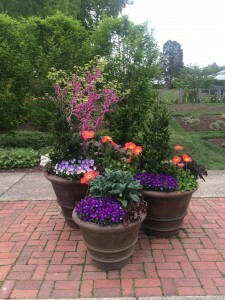 Longwood Gardens in Kennett Square, PA and Chanticleer in Wayne, PA have spectacular planted containers throughout the gardens. You can also buy combination containers already planted and ready to place on your deck or patio from most local garden centers. This entry was posted in In the Garden by Susan S Barton. Bookmark the permalink.